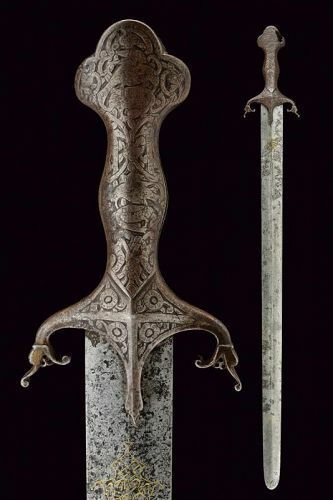 Wide, double-edged blade with thin central raiser, base with two cartouches bearing gold-inlaid inscriptions in Arabic; iron, two-pieces grip with langets, quillons faced towards the blade ending in stylized elephant's heads. Sword bears name of Qujar king Nase-Al-Din Shah on one side and his title on the other. Naser-Al-Din Shah ruled from 1848 until his assassination the day before country was celebrating his 50th year of his reign on 1898. Surface finely engraved with birds and floral motifs, back with parts missing and strong rust signs. Persia, Mid 19th Century length 92.5 cm.